I took them for granted, the dishes rolling off my tongue as they had for most of my life. I didn’t question differences. I went to a Mexican-themed restaurant and ordered with aplomb, not at all intimidated by the gamut of delectables that end in either a or o, having a reasonable expectation of what I was getting from chimichanga, enchilada, and chile relleno. When faced with a tortilla, it seemed I somehow intrinsically knew what to do with it. I thought we all did. It wasn’t until my British wife-to-be, Emma, began grilling me that I waffled. We visited California. We visited Texas. We visited Taco Bell and Mexico. Each time she’d tried something new—quesadilla or taquito—and the questioning persisted. “Why is this a fajita and not a taco? It’s all the same stuff.” I tried to remain patient, choose my descriptions carefully, but when fold came to wrap, the explanations were vague and unsatisfactory to her, me as well. Her experience of Mexican food originates from Old El Paso boxes in the foreign food aisle of Tesco (the European Wal-Mart). 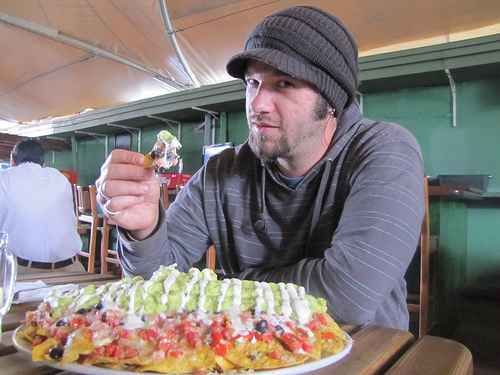 Until visiting the US, to her, nacho meant the same as Dorito, and tortillas were more or less a gimmick. For Emma, Tex-Mex versus the real food of Mexico meant poquito to nada. So, she grilled me over subtleties in the world of tortillas. After a month of attempting to define dishes differently, I had relented under the pressure. I didn’t know—exactly. Burritos are filled with meat and/or beans, generally combined with rice, cheese, avocado, lettuce, salsa, and/or sour cream, etc., all encased in a wheat flour tortilla. The name burrito translates to “little donkey”, but the dish is also known as taco de harina (of flour). Legend has it that a taco salesman, Juan Mendez, who used a donkey to transport his product, may have invented the burrito, believing the rolled-up tortilla would keep the filling warmer. Tacos, on the other hand, have many of the same ingredients—the cheese and meat, salsa and sour cream—but typically lack the rice and beans. As well, tacos can come in either a hard, fried “shell”, in a soft flour tortilla north of the border, or usually in handmade corn tortillas (we’ll get into these a little later) south of the border. Tacos, unlike burritos, are not cylindrical but are formed by simply folding the tortilla in half and getting down to business. When I think of tortillas, typically what comes to mind first is the classic flour tortilla, about nine to twelve inches in diameter, pressed nearly paper thin, usually wrapped around some greasy mystery and the whole thing enveloped in waxy plastic: Mexican fast food. The Southwestern US abounds with options. The entire country knows to “run for the border” on those late nights of drinking. We—at least, I did—grew up with Taco Bell as a very close second to McDonald’s. For more refined dining, my family used to go to Chi-Chi’s Mexican Restaurant (still going strong in Belgium, Luxemburg, UAB, Kuwait, and Indonesia), and we’d gorge on bottomless chips and salsa before tucking into giant tortillas stuffed with cheap meat, smothered in sauce, next to refried beans and rice, all on a scorching platter of a plate. Eventually, the US Chi-Chi’s went teats up due to an outbreak of Hepatitis A traced back to its Bear Valley Mall location. In sum, growing up in the US didn’t give me an accurate perception of what Mexican cuisine is. It familiarized me with names of things and took all the exoticism out of the tortilla. Unfortunately, corporate/chain restaurants and US distributors of Mexican food pretty well ignore the more common corn tortilla, a smaller, fatter, and more pungent version of the what will probably forever, and erroneously, be known to me as the standard: flour tortilla. The origin of the Chimichanga is debated, claims coming from Arizona, from Mexico, from half-Irish people. Regardless, the dish basically breaks down as a burrito (described above) deep-fried then served drowned in some sort of sauce, either cheesy or sour cream-based, guacamole or salsa, and utterly, unhealthily delicious. Generally, chimichangas go under the Tex-Mex heading rather than authentic Mexican. Quesadillas, slightly less offensive to dieticians, are similar to tacos. They have the same ingredients (though quesadillas often include beans) and are folded as opposed to burrito-wrapped. However, quesadillas are either pan-fried or toasted after assembly, creating a flatter, more spread-out version of a taco, usually cut into triangular sections when served. Unlike the taco, the cold ingredients—lettuce, guacamole, and salsa—are toppings rather than fillings. Now, having traveled to all but one Central American country (sorry, Nicaragua) and having lived in Guatemala three times (for a total of about two years), I know that flour tortillas are a bit of a sham. Locals don’t eat them, or at least not nearly as much as the corn tortillas, which are generally handmade at the sides of streets, in food (not super) markets, or at hole-in-the-wall tortillerias. They are fresh and cheap and much more of an acquired taste. 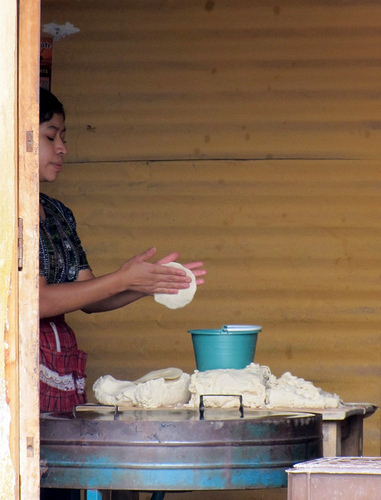 It’s a beautiful sound, walking through the streets of Mexico and Central America, hearing that culinary rhythm of women slapping masa—dough made of maize—from hand to hand before snapping them down on the griddle. Fresh corn tortillas come a bit greasier, a little thicker, and with a bit of a sour aftertaste wholly unfamiliar to the flour tortilla crowd. Many foreigners remain exclusive to the wheat-based, but for the real thing, you have to go the corn route. In reality, most of those dishes I grew up loving, the same that I labored over telling Emma the differences between, are products of the corn tortilla. Save for the burrito and chimichanga, the Tex-Mex quesadilla, Latin America makes all of her tacos, enchiladas, and so on with the corn tortilla. It’s such a staple that a stack of corn tortillas accompanies just about everything, from stews and soups to drumsticks of fried chicken or simply some lime and salt. Fajita, I’ve recently learned, is actually just a way of saying taco with grilled meat. Originally, the “faja” part of the dish denoted a particular cut of beef not found commercially, so the dish remained relatively obscure, enjoyed mainly by cowpokes and butchers. However, the fajitas of today allot for chicken, shrimp, pork, and basically anything one can throw on that sizzling cast iron skillet which signifies that some diner has gone the fajita route. Flautas, in the other hand, are flour tortillas rolled tightly around filling, usually a simple combo of meat and cheese, then fried. The term flauta means flute and obviously comes from the dish’s resemblance to the instrument. These delicious snacks, which have appeared in the US frozen food market, are often confused with taquitos, which are more or less the same thing but done with a corn tortilla, creating something more akin to the swizzle-stick hard shell taco. Ultimately, Emma’s constant pestering got to me, as is evidence in the existence of this article. Her insistence was that I—as if I had personally named each food item we sampled—was calling something different only by virtue of how the tortilla was folded. She’d begun to mock me, creating new methods of folding and wrapping and names to go along with them. The worst part was that I found myself scrambling to dispute her objections. She was winning. Ultimately, I came up with a defense that silenced the criticism: When visiting England, we always go for a pasty, a staple of English finger foods, basically pie crust folded over filling. Put it in an oven dish and it’s a pie proper. Put the dough in the filling and you’ve got dumplings. Put it in a pot and it’s a pot pie. Put it in Italy and it’s a calzone. Put it in a Mexican eatery and it’s an empanada. And so on. “Isn’t it all the same thing?” I asked. Really, I knew the tortilla never needed me to defend it. The world at large has been taken by storm, gone the way of wraps (sandwich stuff inside of tortillas), specialty variations like spinach and roasted red pepper have surfaced, and there has been an explosion on the breakfast scene, burritos untraditionally stuffed with scrambled eggs and omelet-like frills. With such versatility, the tortilla’s newfound popularity was inevitable. It was always in the pudding. Pupusas: An El Salvadoran favorite made by stuffing extra-thick corn tortillas, especially with fresh cheeses and/or chicharron (paste-like ground pork). Mexico has a similar though more fully stuffed version called gorditas (little fatty), and South America has a version called arepas. Enchiladas: Enchiladas are probably the most familiar in this list as they are found in most Mexican restaurants. Essentially, enchiladas are the tortillas ode to the casserole. Enchiladas are filled with any variety of ingredients, covered with a pepper sauce, and baked. Chilaquiles: A Mexican dish in which tortillas are cut into quarters and fried before being simmered in a salsa, sometimes a mole, until soft again. Ultimately, the concoction is topped with fresh cheese, sweet cream, and served with refried beans. Doblados: Literally meaning doubled (over, in this case), the Guatemalan specialty is basically a simpler version of the better known quesadilla. Farmer’s cheese, a white and rather crumbly make, inside a tortilla and fried crispy in a skillet. Baleadas: People who visit or live in Honduras swear by the baleada, which starts with a large flour tortilla and mashed fried beans. Fillings to fit the appetite, from cheese to eggs to sausage to plantain, and especially chismol (a tomato-pepper-onion mixture) are added before the tortilla is folded in half and served as is. Jonathon Engels has been an EFL expat since 2005, just after he earned an MFA in creative writing and promptly rejected life as an instructor of freshman comp. He has lived, worked and/or volunteered in seven different countries, traveling his way between them. Currently, he is in Antigua Guatemala, where most mornings he can be found tucked behind a computer in the corner of a coffee shop. For more from Jonathon, check out his website and blog.